This year, give them a gift that they will remember, treasure, and love forever – a Songfinch personalized song, written just for them. When Songfinch reached out to me last year and asked if I’d like to try out their personalized song writing services, I thought, “Cool. Sounds like a it could be something that my readers would LOVE. Plus, what a great way to give all those young, hungry singer-songwriters a solid side-hustle!” (Really, it’s all side-hustle when you’re a young, hungry songwriter, right? ) So I put a pin in it and waited for the right time to come around. That “right time” happened last month as Mr B and I were preparing to leave on a Caribbean cruise to celebrate our wedding anniversary. I wanted to do something really special for him, and at first thought of writing a song myself. But then I remembered Songfinch, and I thought, if there was ever a great time to try their personalized songwriting service out, this is it. 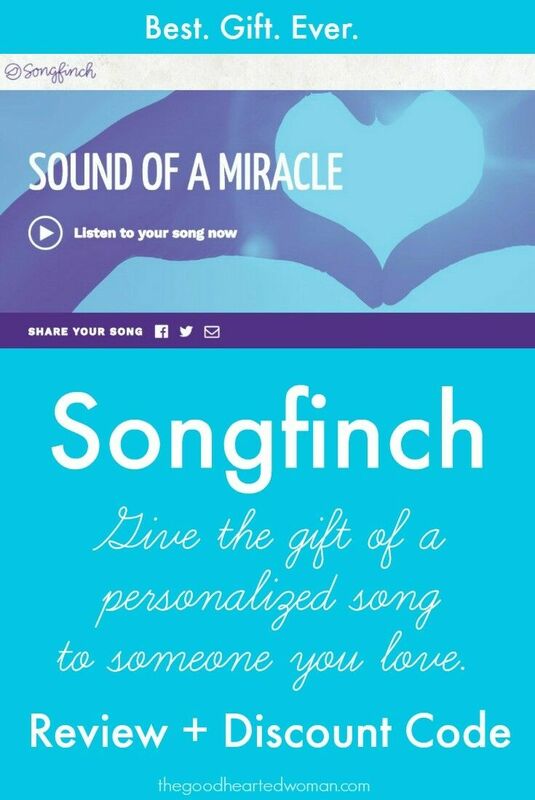 Songfinch promises that, in a week or less, one of their professional songwriters will craft a one-of-a-kind song, based on your story, that you can give to the one you love. And boy-o-boy, do they deliver! Giving a Songfinch Personalized Song is Easy! 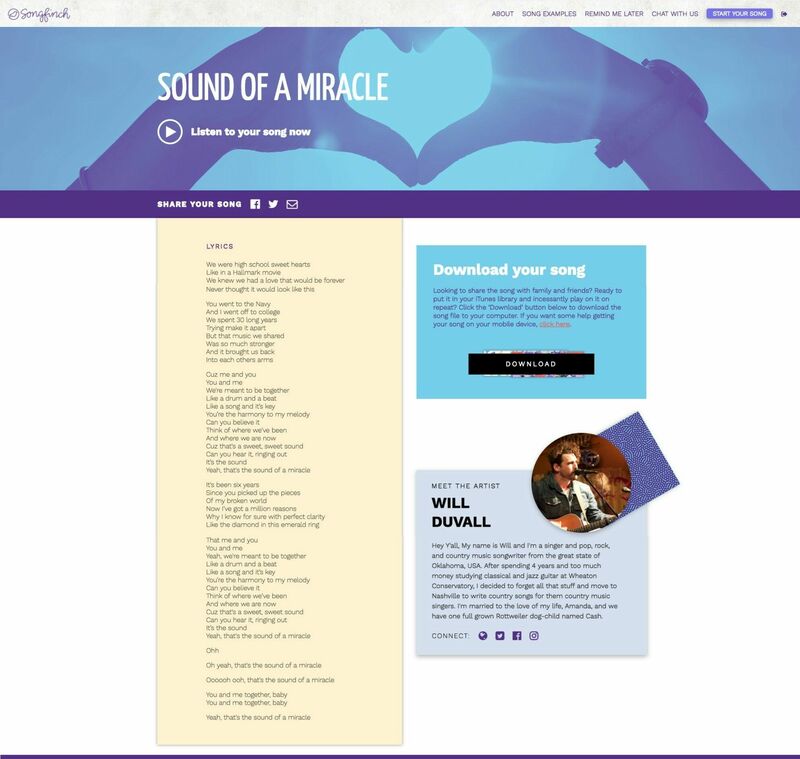 When I began ordering my song from Songfinch, one of the first things I noted was how smooth and streamlined they had made the entire process. It was far easier than I had imagined; especially when we’re talking about asking a complete stranger to craft something so personal. The whole Songfinch ordering process took me just 30 minutes. 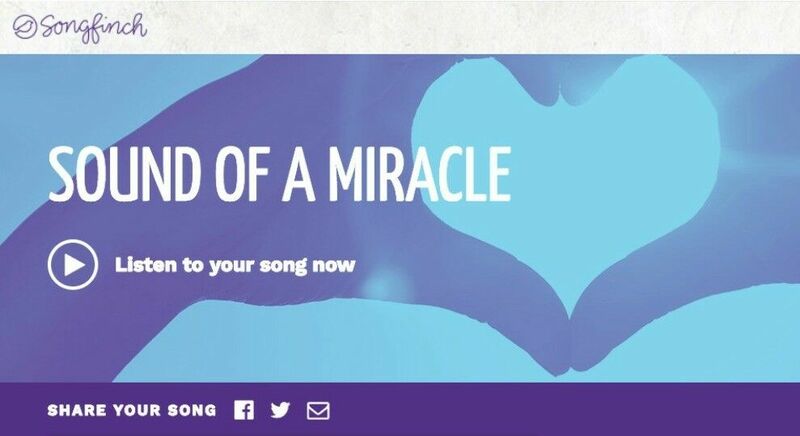 After I filled it out, mine read: I want to give my husband a song for our anniversary that makes us remember how much of a miracle our relationship is. The next screen, on which you share your story, is the most time-consuming. Completing it took up about 25 of the aforementioned 30 minutes. I’m including our personal story below in case you’d like to see how much of what I gave them is woven into the lyrics of our completed song. Our story reads like a Hallmark movie. My husband and I met in choir during our sophomore year of high school. He was a gifted guitar-playing baritone who loved Elvis and old-timey country music, and I was a passable soprano with an affinity for ’70s singer-songwriters and classic arena rock. By the end of our junior year, we were engage to be married and had become one of those couples that everyone just knew was going to make it. However, after our senior year, when he went in the Navy and I went off to college, fate stepped in, and we broke up. Thirty years of life went by, and then by some miracle, we got a second chance. We were married on the same date we had chosen way back when, and the little diamond that he gave me back in high school is now in my wedding ring, flanked by two emeralds as a nod to our May birthdays. So now instead of celebrating our 35th anniversary, we are celebrating our 6th year of marriage. Some things don’t change though: music is still one of the cornerstones of our life. We play and write songs together, enjoy making music with our extended family, and can’t imagine our lives without music in it. After writing up the story paragraph, there are just a few quick screens that allow you to specify a mood or two, genre (everything from country to hip-hop to acoustic pop), and whether you would prefer a female or male vocalist. For mood, I chose Romantic & Reflective. For genre, I wrote that I would like “something singer-songwritery with maybe a bit of a country vibe.” (If you listen to our song, you’ll hear that our singer-songwriter, Will Duvall, absolutely nailed this one, despite my ridiculously specific description.) Conversely, I didn’t specify what kind of vocalist: I just wanted the best person for the job, regardless of gender. After I submitted my song application, I received a series of emails from Songfinch letting me know that my song was on its way, and then I sat back and waited. No. That’s not true. I ran around the house trying to pull everything together for our trip while I worried that the song might not arrive in time because I had accidentally forgotten to order it until exactly a week before we set sail, when I would likely have no wifi access. As I mentioned earlier, Songfinch promises to deliver your song within a week, but I cut it way too close for comfort, and that was on me. 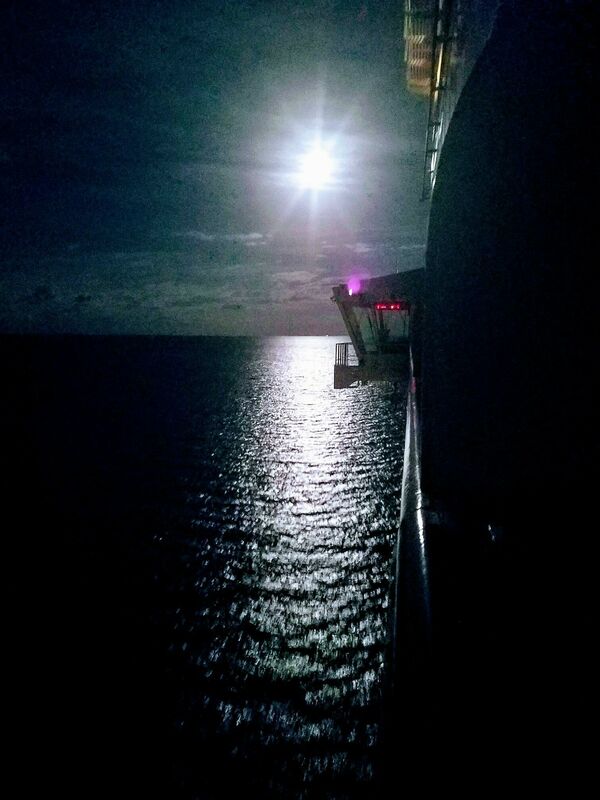 Five and a half days later, however, on the evening before we were to take off on our flight to Florida from where our ship was to embark, I received an email letting me know that our song was ready. 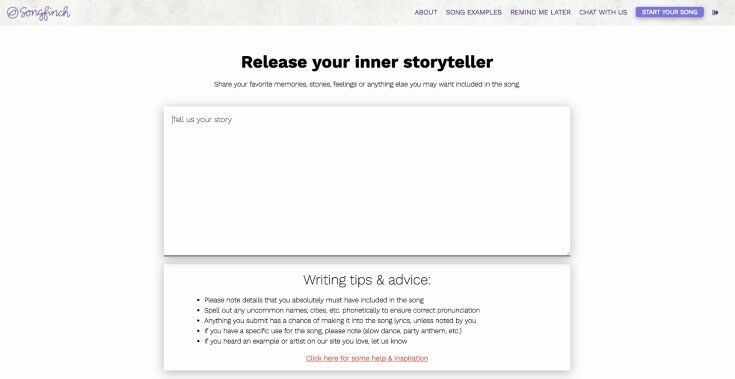 I could listen to it, download it, read the lyrics, and learn about our singer-songwriter on our personal Songfinch page. 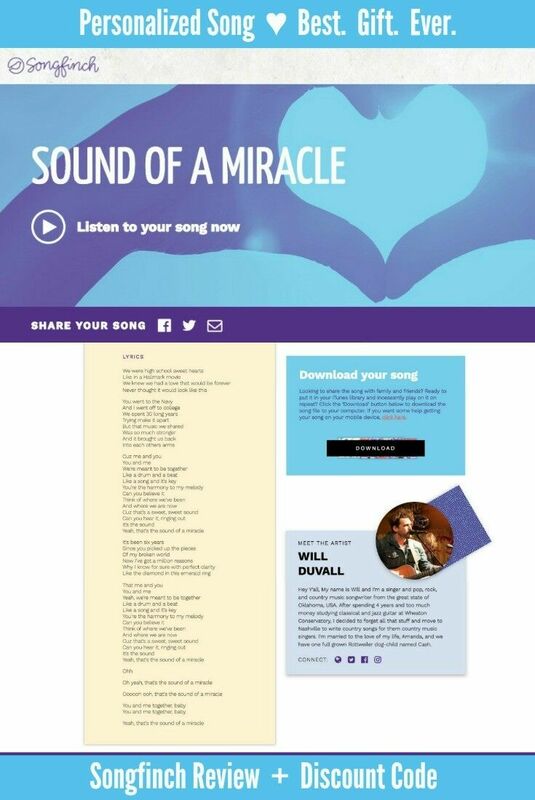 CLICK ON THE IMAGE TO LISTEN TO OUR SONG: This is our personal song page on Songfinch, where we can download our song, read the lyrics, share it on social media, and learn about our singer-songwriter. Still, I pressed play on the website with some trepidation. I mean, a week is a pretty small window in which to write, record, and mix a song (unless you’re Jackson Browne or one of the Nashville Cats), and I was a little concerned about how well everything would turn out. One more quick note before I go dark for a week: I just listen to the song four times and I couldn’t wait to let you know how much I LOVE IT! Everything is perfect, and I couldn’t be more pleased. I’ll check in when I get back, but in the meantime, please pass on to everyone involved my pure delight and deep appreciation! Thank you so much! So how did my gift go over? Well, after a wonderful day strolling the streets of Old San Juan, as we spent the evening sitting on our balcony and watching the lights of Puerto Rico drift off into the distance, I told Mr B that I wanted to play a song for him. That’s when things got a little funny (haha, not weird), mostly because I didn’t tell him anything else ahead of time. As he listened to the lyrics, at first he thought it was a song by someone with a story that mirrored ours to a remarkable degree. Then he thought maybe I had written it and had someone else record it. Then, when he finally figured it all out, he LOVED it! If you would like to order a song for someone you love, use this discount code – GOODHEART – when you check out for $20 off a Song From Scratch. Disclosure: Our thanks to Will Duvall and everyone at SONGFINCH for creating and recording our song, free of charge. This post may contain affiliate links, which means we may receive a commission if you click a link and purchase something that we have recommended. While clicking these links won’t cost you any extra money, they do help keep this site up and running. As always, all opinions and images (except as noted) are my own. Please check out our disclosure policy for more details. Thank you for your support! Exceptionally easy to raise, Mason Bees are ultra-gentle uber-pollinators that will improve the health and well-being of your flowers, fruit crops, and garden. We teamed up with BeSpoke Bee Supply to bring you this sponsored post. This post may contain affiliate links, but don’t worry – they won’t bite. Are You a Backyard Gardener? Have you heard about Mason Bees? These little non-stinging, super-pollinating bees are one of the best kept secrets of the gardening world, and Mr B and I are excited to be welcoming them into our garden this spring! Admittedly, until recently I didn’t know much about Mason Bees. I knew that they used mud for something, and they are usually included as a footnote in articles about the global impact of our overstressed honey bee population, but that’s about it. That all changed when BeSpoke Bee Supply reached out to ask if we’d be interested in raising Mason Bees and sharing our experience with you. However, I can’t very well share, much less endorse, something I don’t know about, so I set about educating myself. As in, somewhere in the process, the hyper-obsessive researcher in me grabbed the reins and made me spend hours and hours pouring over everything I could find on the subject; and just like that, I’ve got the equivalent of a minor in Mason Bee husbandry and we have a Mason Bee Cottage all set up and open for tenants in the backward. I’m excited to share what I’ve learned so far with you. 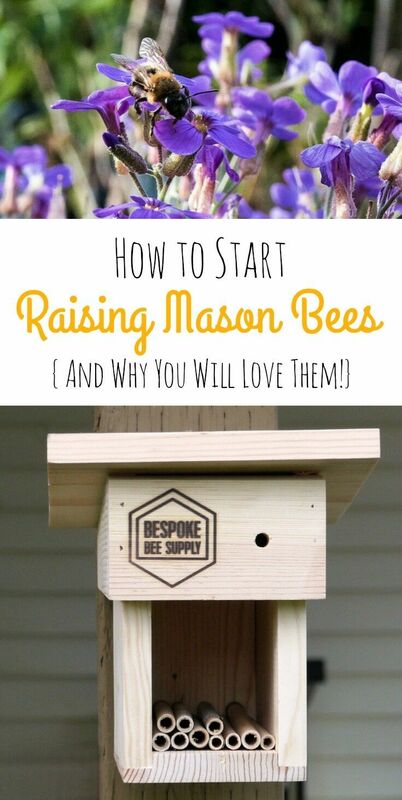 Read on for everything you need to know about why you should raise Mason Bees, and how to get started today! Mason bees are solitary nesting bees that emerge in early spring and lay their eggs in long, skinny tubes. 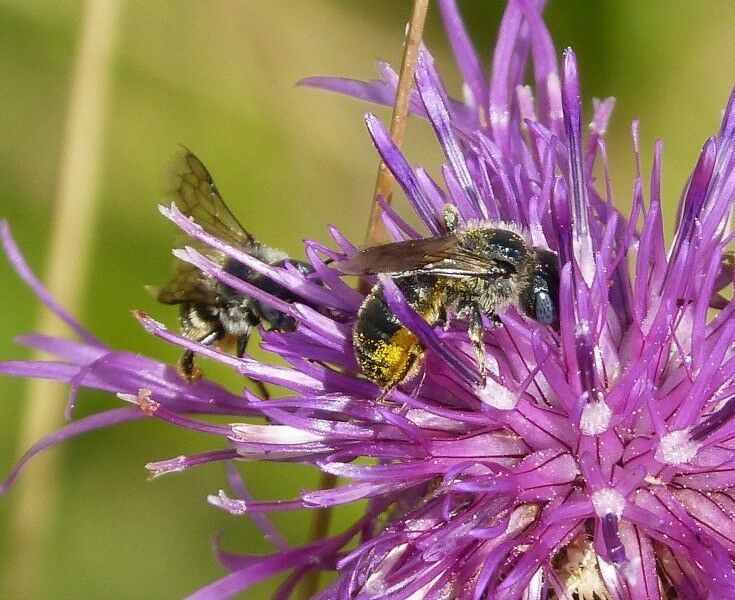 These super-pollinators are exceptionally gentle and will only sting if you trap or squeeze them. (Can we all just agree to not squeeze the bees, ok?) There are about 300 species of Mason Bees found across the Northern Hemisphere and in Australia, so chances are you can find them in your area. Moreover, they don’t make honey, so there’s very little upkeep involved in raising these fuzzy little garden friends. Mason Bees tend to stick closer to home. 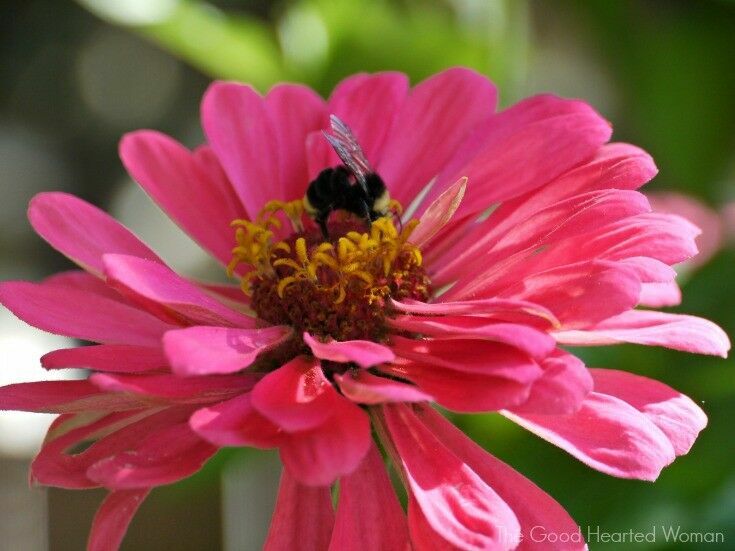 Honey bees will range up to two miles from their hive, while Mason Bees usually stay within 300 feet of home. Raising Mason Bees takes almost no time. In exchange for an hour or two hour each year, your Mason Bees will improve the health of your fruit crops and garden and give you hours of relaxing entertainment in the process! 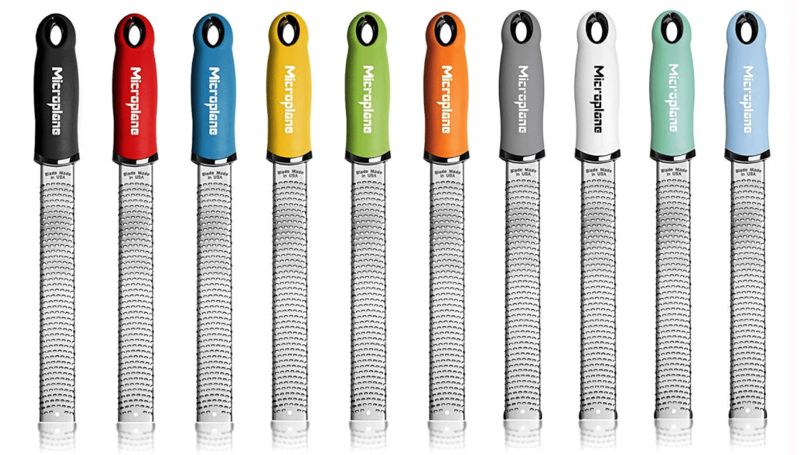 Why don’t Mason Bees Sting? Mason Bees are categorized as “solitary bees.” This means that each female is a Queen Bee and – like most single mothers – must do all of the work herself; including gathering pollen/nectar, laying eggs, and doing upkeep on her little mud nursery. She simply doesn’t have the time or disposition to get all aggressive and defensive, so you can get very close without any fear. Mason Bee eggs hatch almost immediately after being laid, and the larvae eat, grow, and pupate inside their little mud cell. The larva relies on warm spring and summer temperatures to grow, and by the end of June, each larva has spun a waterproof cocoon. The bees overwinter as fully-formed adult bees in fuzzy, wrinkled cocoons that look like the raisins you clean out of the backseat of the car. A new season of spring Mason Bees will begin to emerge when the weather begins to warm, and the cycle begins again. Everything I read about attracting Mason Bees for your first season is all very Field of Dreams, in that if you build it, they will come. In other words, give them an attractive place to live, a ready supply of mud, and a nearby garden or fruit trees, and they will move right in. With that in mind, the first thing you need to do is decide where your Mason Bees will live and what they will live in. The latter part of this was a no-brainer for me because Bespoke sent me a beautiful Mason Bee Cottage (that sounds so rustic and cozy!) to help me get started. 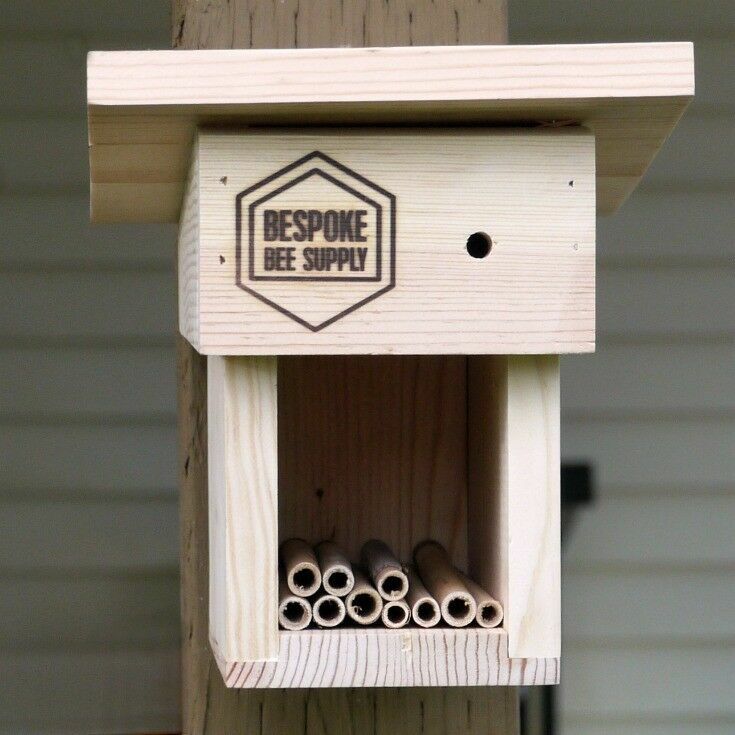 If you order a Mason Bee Cottage or Apartment from Bespoke Bee Supply, it will arrive fully assembled and comes with 10 Mason Bee Tubes. Bespoke sands everything down for a nice, smooth surface, and suggests that you finish the exterior with a coat of high-quality tung oil. 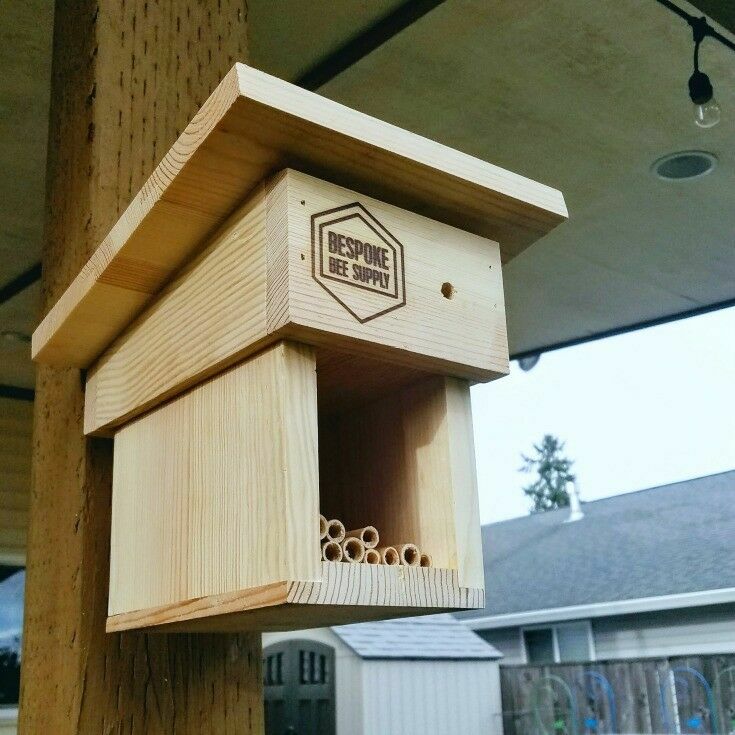 By finishing your Mason Bee Hive, you’ll increase the life of the hive and make a more beautiful home for your new little Bee Buddies. 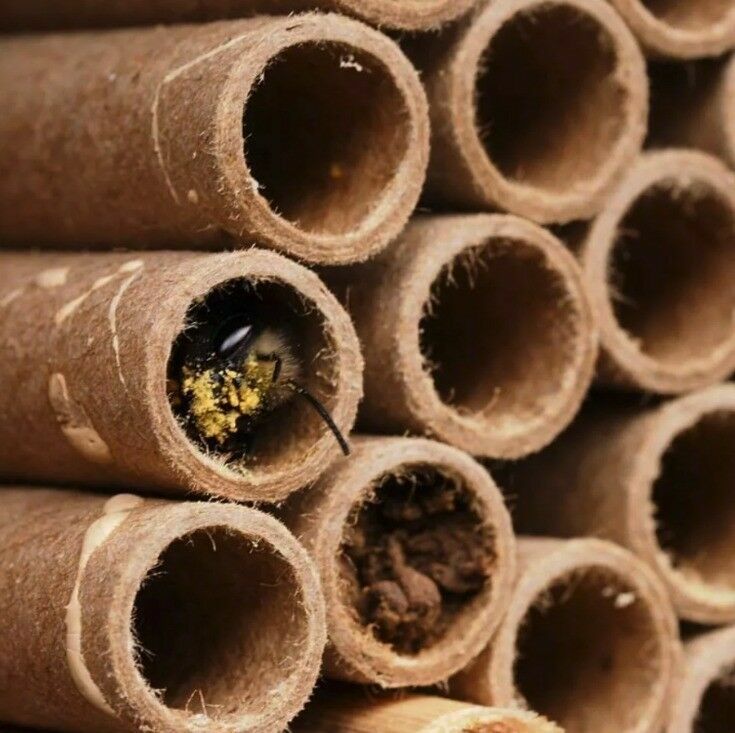 Setting Up Your Mason Bee Digs is as Easy as 1-2-3! 2. Make sure there is a supply of moist, clay-rich mud nearby, or at least the “ingredients” to make mud. (If you live in the Pacific Northwest, this shouldn’t be a problem!) Mason Bee mamas need mud to seal their eggs into their little cells, so it’s important that they have open ground with moist clay mud for building their nesting chamber partitions. Of course, they can make their own mud with a ready supply of water, but if you have little kiddos around, I’m sure that they would love to help out by making a great big mud pie for your Mason Bees! 3. After you harvest your bee cocoons in the fall, give your Mason Bee Cottage or Apartment a good cleaning with a stiff brush, and store unused tubes in a dry place. A few minutes of maintenance each year will go a long way toward extending the life of your Mason Bee home and nesting materials. Wait, what?!? What’s that about “harvesting bees“?!? Don’t worry – “harvesting bees” sounds a lot scarier than it is! Really, it’s more like harvesting “bee seeds.” It’s all a very easy process that simply involves removing the Mason Bee cocoons (aka “fuzzy raisins”) from the tubes, sorting them, cleaning them in a bleach mixture, and popping them into the fridge in a breathable container for the winter. Bespoke has an excellent informational page on their website that explains each step in great detail. 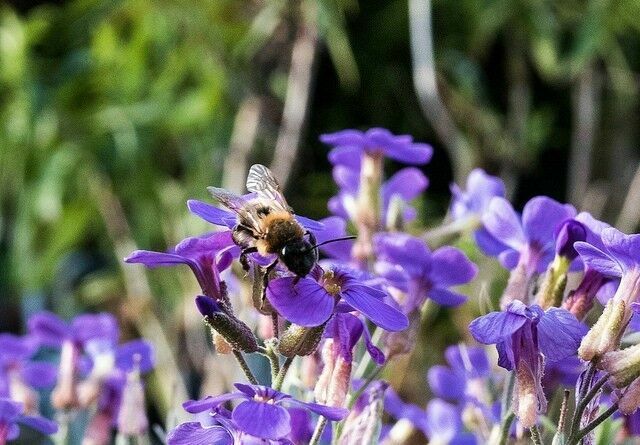 PORTLAND AREA RESIDENTS: If you are lucky enough to live in the Portland area, a regular schedule of bee keeping classes is offered through Bespoke Bee Supply each month. Sign up for a Mason Bee class to learn everything there is to know about how to keep Mason Bees and how to harvest their cocoons, and hang out with some great people who know way too much about bees at the same time! Early Spring: Set out your Mason Bee home and make sure there is water and clayey mud nearby. 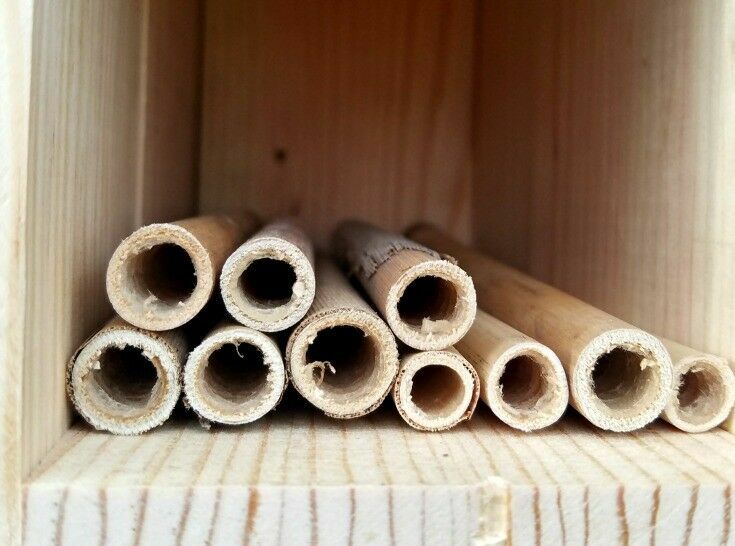 Put out your cocoons if you have them from a previous year, and new Mason Bee tubes. [If you are concerned about attracting bees the first year, you can spray an attractant to entice free-roaming mason bees to your cottage or apartment (…which upon rereading sounds way racier than it is meant to).] Temperatures should be reliably above 55°F, and plants should be beginning to flower so that your bees have something to eat. Late Spring (end of active period): Collect nesting tubes and store them in the garage or shed to protect them from harsh weather and parasites. Fall: Store harvested bee cocoons in the fridge in a breathable box. Mason Bee cocoons like a little humidity, so be sure to include a very slightly moist paper towel alongside your cocoons and check it regularly to insure that it stays moist. Mason Bees and nesting materials also need to be cleaned each fall to protect them. 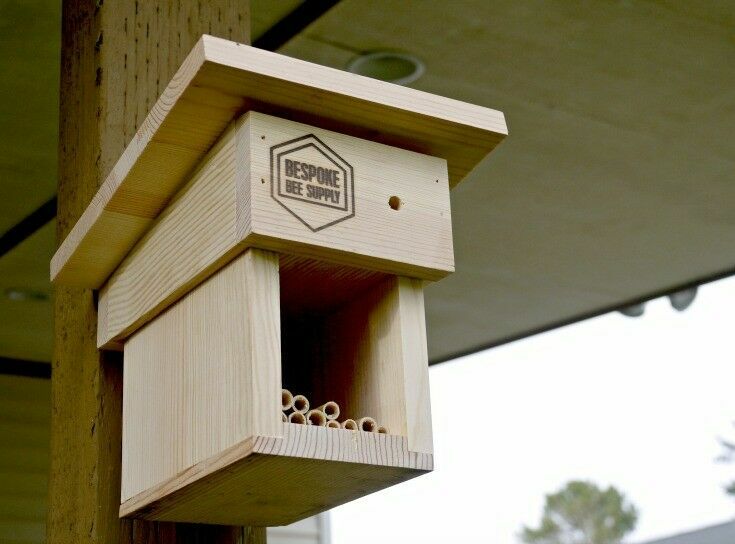 Visit Bespoke Bee Supply to order your Mason Bee Cottage or Apartment, and for more information about raising Mason Bees. 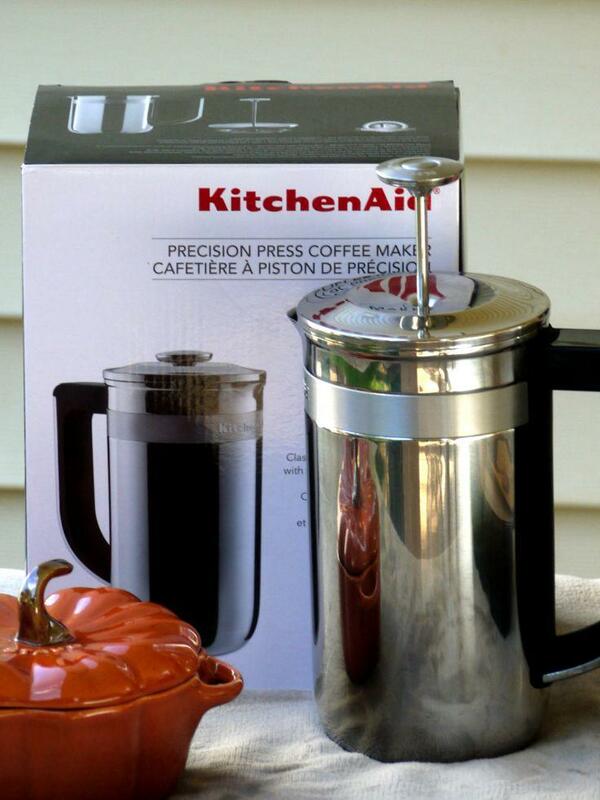 Looking for a thoughtful, easy gift that is sure to bring a smile? Then you should definitely check out Cookies by Design. The colorful, decorated cookies arrive individually shrink-wrapped, with a plastic sleeve stuck to the back with a dowel inserted, allowing the cookie to be securely placed in the base. I loved the cheery vibe that our Cookies by Design bouquet brought to our home! The colors were bright and vibrant, and it just seemed to make the whole room a little sunnier! As you can see by my “Good Vibes” cookie, you can customize cookies with your own special message. So, the cookies were bright and beautiful, but how did they taste? Cookies by Design makes all their cookies from scratch, but I have to be honest: they weren’t my mom’s sugar cookies. (Nor did I expect them to be.) For reference, like my mom before me, I use the my trusty old Better Homes & Gardens Cookbook sugar cookie recipe. These were slightly less sweet than mine, but not too much so, and I actually think less sweet is better than too sweet, especially considering many of the cookies are completely covered in icing, which just brings more sugar to the party. The Cookies by Design cookies were also significantly thicker than my homemade cookies – well over a quarter-inch thick – and a bit more solid than I personally prefer. However, I found that when we were ready to actually eat the cookies, just ten seconds in the microwave did a world of good for the texture, bringing them back to a more “freshly baked” feel and softer consistency. Cookies by Design bouquets are great for any occasion: holidays, birthdays, celebrations, or just to say “I’m thinking of you.” If you take a little time to browse through their website, you may be as surprised as I was at the sheer number of occasions for which they have created cookie bouquets. (I know I was. Did you know that there is a “Father-in-Law day?!? Yep, they’ve even got a bouquet for that one!) You can customize also any bouquet with your own message. Prices start at just $18.99 and go up from there, depending on how many cookies you want in your bouquet. 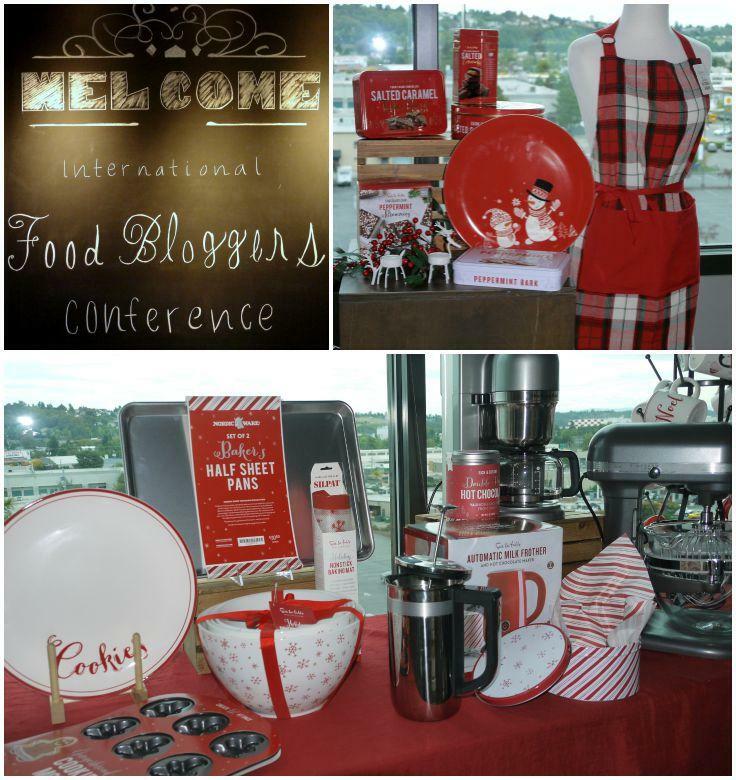 Find the latest sales & discounts from Cookies by Design on our Partner Page. In addition to their colorful cookie bouquets, Cookies by Design also offers made-from-scratch gourmet cookies, cookie trays, cookie cakes, and (new) chocolate truffles! Bottom line: a cookie bouquet from Cookies by Design is a great choice for brightening someone’s day, whatever the occasion! You should definitely check them out! Disclosure: Many thanks to Cookies by Design for providing this beautiful cookie bouquet to us for review free of charge. As always, all opinion are my own. This post contains affiliate links, which means we may receive a commission if you click a link and purchase something that we have recommended. While clicking these links won’t cost you any extra money, they will help us keep this site up and running – and (relatively) ad-free!! Please check out our disclosure policy for more details. Thank you for your support! 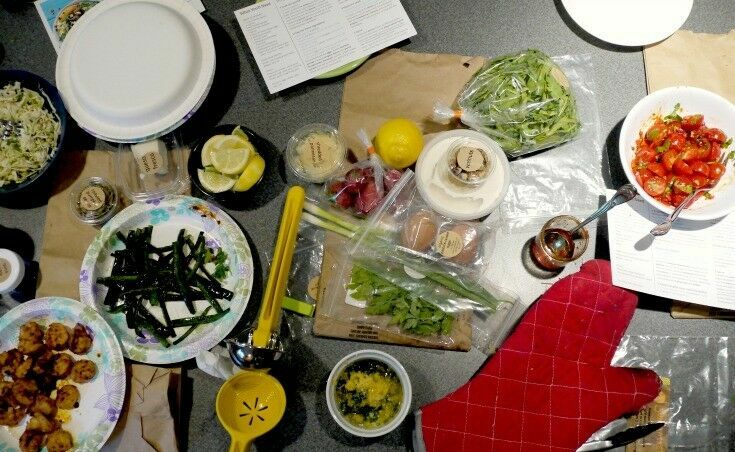 SUN BASKET organic meal kits deliver everything you need to cook easy, delicious, nutritious meals right to your front door. 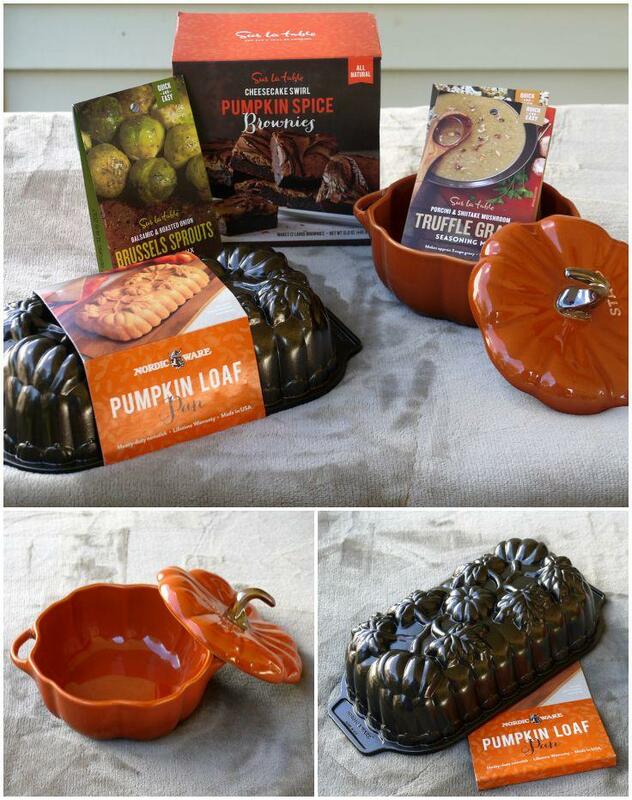 BONUS: SUN BASKET will give you all their recipes – no strings attached! 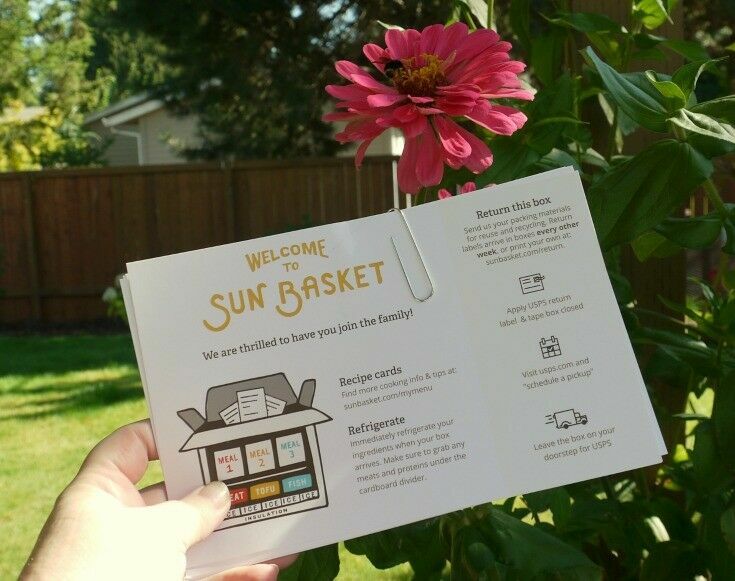 Let’s start with a little about Sun Basket. I have to admit that I’m kind of intrigued with the vast number of weekly or monthly food delivery services that have been popping up in the last couple of years. For a small fee, you can have everything from fancy European chocolates to curated vegan cuisine (and virtually everything in between) delivered to your door on a regular basis. In the past couple of months, I’ve been sifting through the chaos to discover the best of the bunch. 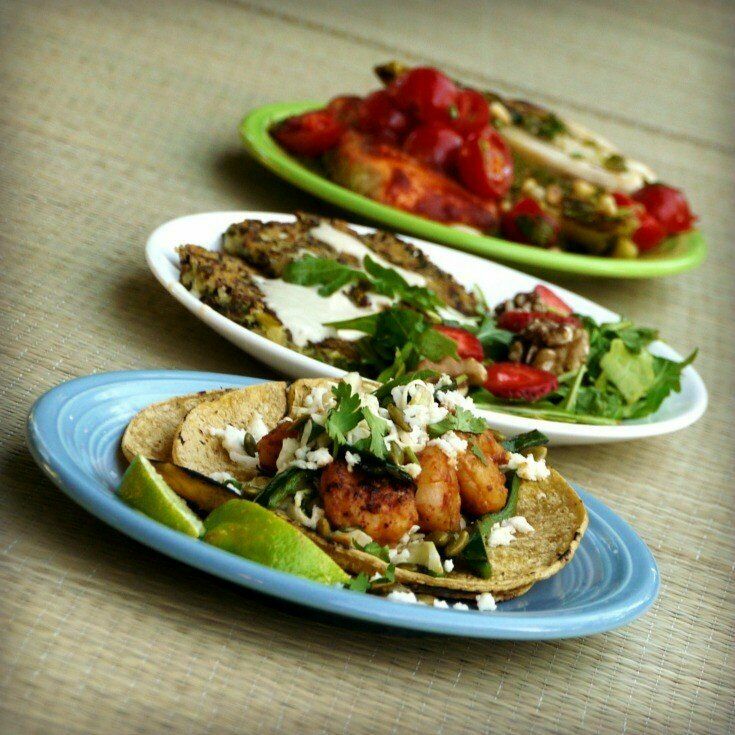 Certified organic, non-GMO, sustainably sourced, seasonal ingredients from the country’s top farms. 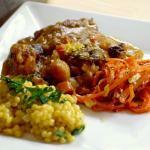 Paleo, Gluten-free, and Vegetarian options. 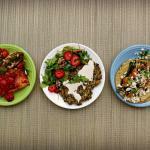 Healthy, innovative, easy-to-prepare meals that require 30 minutes or less to prepare. Environmentally responsible, 100% recyclable packaging. The online ordering process itself is very simple, but our household dynamics make it just a bit tricky. Until very recently, we had very a full house – including kids home from college for the summer and married kids landing for a few weeks. And guess what? Everyone had a slightly different eating style! Our shipment arrived on time, as scheduled. I was very impressed with the packaging, which clearly reflects Sun Basket’s commitment to the environment. 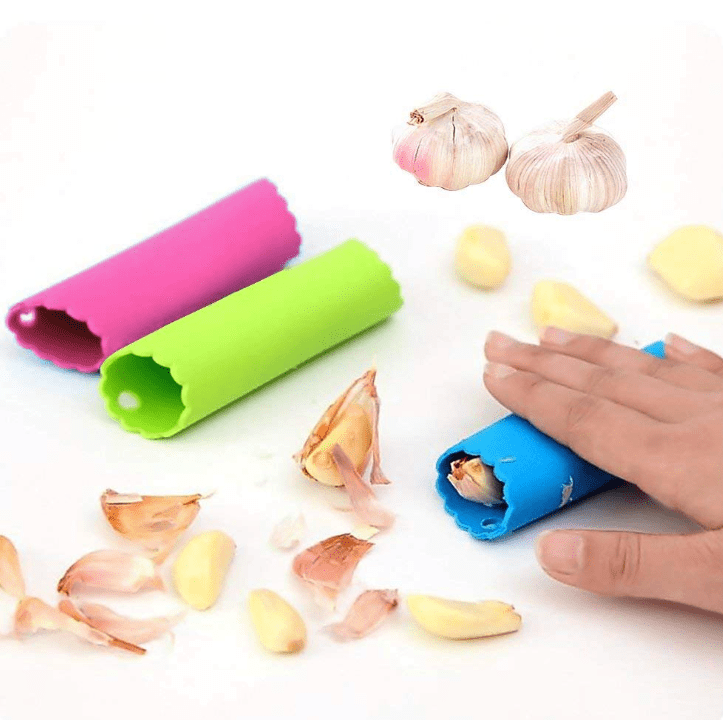 The packaging is 100% recyclable, plus they offer free delivery and free return shipping so that they can reuse the materials. Boxes arrive with clear instructions on recycling, and the sauces came in awesome little reusable plastic containers with lids. 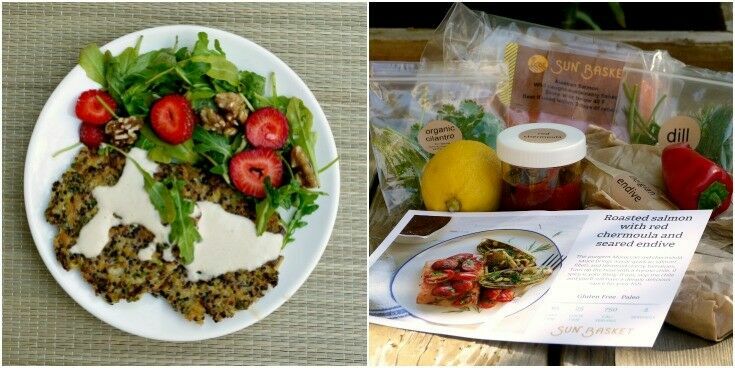 All of the ingredients arrived fresh and in premium shape, including tricky-to-ship items like strawberries and cilantro. Ingredients for each meal were clearly marked and packaged together in a brown paper bag, except the fish and shrimp, which were packed separately in the bottom of the box with additional ice packs. 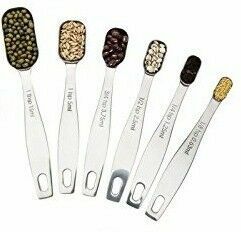 Sun Basket follows best practices when it comes to preparing ingredients, and all allergens are clearly listed. 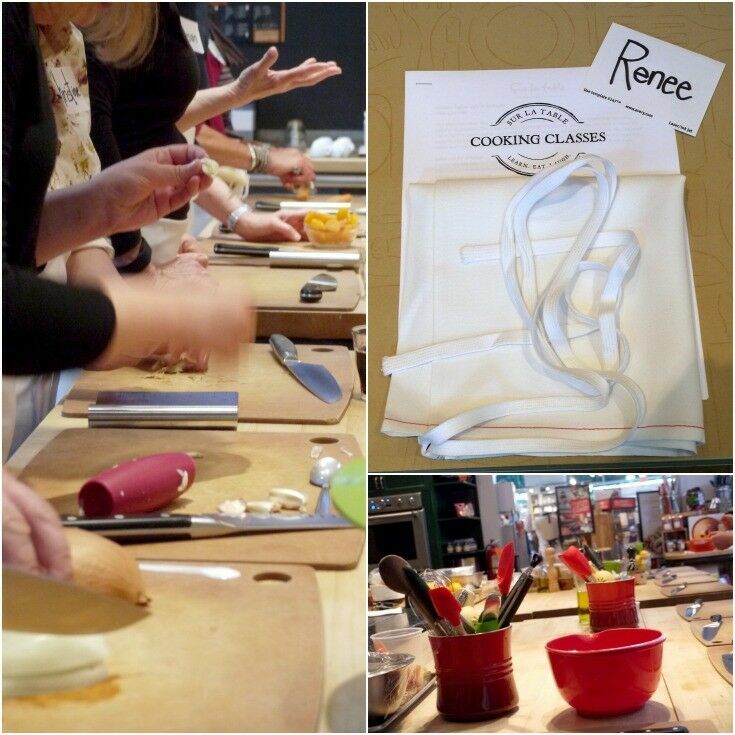 Moreover, while they are not a completely gluten free facility, they take ingredient preparation very seriously. Each meal came with a beautifully photographed, detailed recipe card as well. Each of the meals we ordered serves two. (Four-meal plans are also available.) However, as I mentioned earlier, we had a full house, so we decided to have a party and make all three meals at the same time. Sounds like a great idea, right?!? Let’s just say, I do not recommend it. Things got a little confusing at times. I tried to keep things organized by arranging the ingredients for each meal on top of the bag that it came in. (This part wasn’t as easy as it looks.) 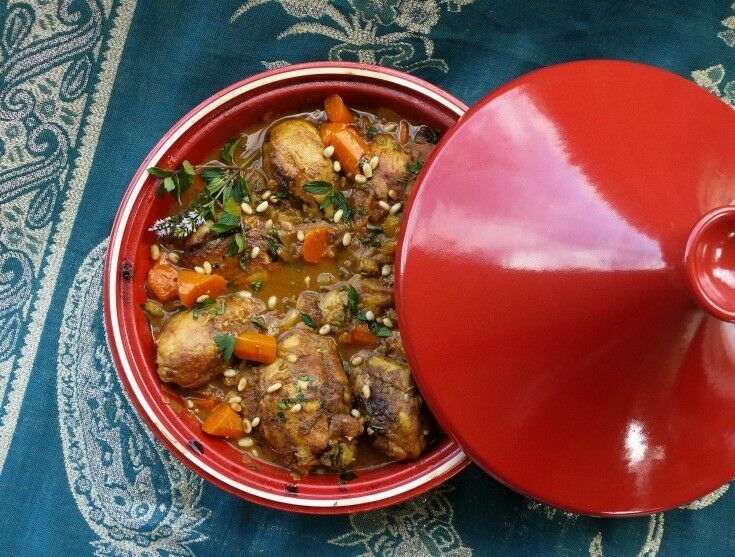 Nevertheless, the meals were simple to prepare, and the directions were straight-forward. It definitely would have been easier it I hadn’t been trying to take pictures and access the process at the same time I was preparing the food! Our meals not only turned out deliciously, but they plated up beautifully. I referred to the photos on the recipe cards for plating, and everything looked as good as it tasted. Each meal provided enough for two decent-sized portions, but in the future, I think I’ll try to have a few extra sides to bulk up the meal for those with heartier appetites. Of the three meals we prepared, the Quinoa Fritters by far went the farthest. Not only did they go a long way, but the Quinoa Fritters were without a doubt the biggest hit from our box as well – everyone in the family loved them! (Believe me, this is no small feat!) They were very flavorful, and had just the right amount of contrasting textures with the crunch of the fried quinoa and the smooth yogurt-tahini sauce. The arugula-strawberry salad paired with them very well too, although honestly, I think almost any light, slightly sweet salad would do the trick. 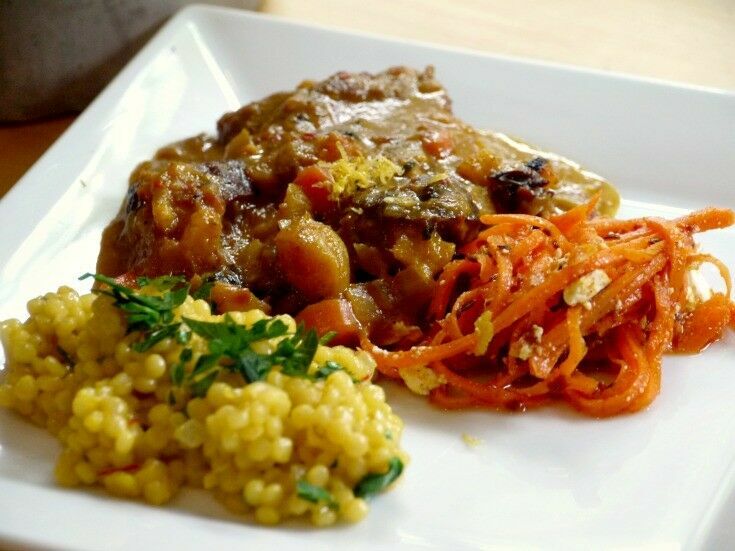 One of the things I appreciate most about Sun Basket’s business model is that (unlike some other meal delivery programs that keep their recipes as secret as an Italian Nona’s sauce recipe) they share all of their recipes online – free to anyone. You can go online right now and browse through their menu. Then click on the highlighted name of any dish, and – Voilà – there’s the recipe! These simple cakes form a gorgeous, crisp crust when pan-seared. Combine quinoa and 2/3 cup salted water in a small saucepan and bring to a boil. Reduce to a simmer, cover, and cook until the quinoa is tender and most of the liquid is absorbed, 15 to 18 minutes. Spread the quinoa out onto a sheet pan or plate. Prep the rest of the ingredients while the quinoa cools. Finely chop ½ cup of the arugula, reserving the rest for the salad. Zest and juice the lemon, keeping the zest and juice separate. Crack the eggs into a bowl, season generously with salt and pepper, and lightly beat. In a medium bowl, combine eggs, scallions, parsley, chopped arugula, lemon zest, panko breadcrumbs, Parmesan, and cooled quinoa. Mix well to combine. Shape into the mixture into 6 patties. *** Add 2 tablespoons of olive oil in a large skillet over medium heat. 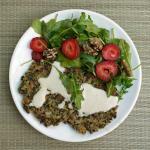 When hot, add the quinoa patties in batches and cook until golden brown and cooked through – 4-5 minutes per side. Transfer to a paper-towel-lined plate to drain. Hull the strawberries and cut into ¼-inch-thick slices. 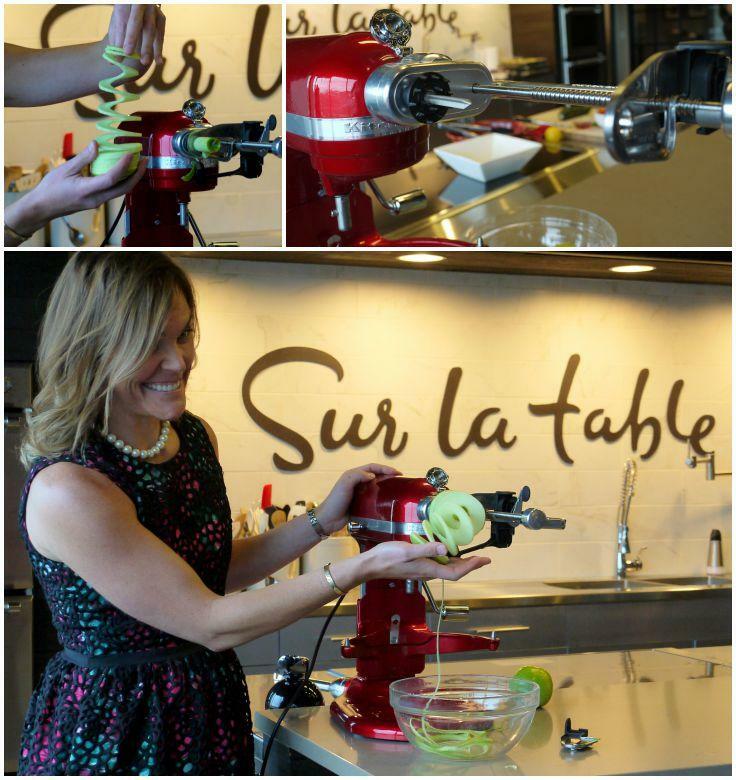 In a small bowl, combine the lemon juice and 1½ tablespoons olive oil. Season with salt and pepper. Add the strawberries, walnuts, and remaining arugula and toss to coat. Season to taste. Transfer the quinoa fritters to individual plates and top with some of the yogurt-tahini sauce. Serve with the salad and more sauce on the side. *** I find that the easiest way to form the patties is by using a 1/3 cup measure. 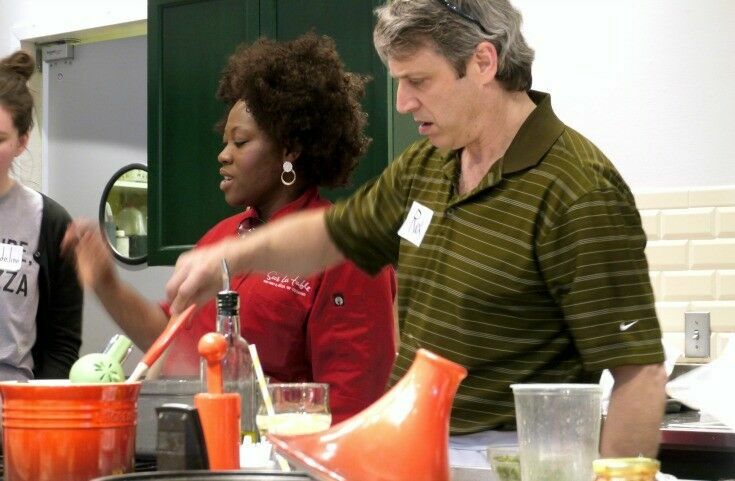 Just pack the quinoa mixture into the measuring cup and turn it out directly into the hot skillet. Flatten slightly with the back of a spatula and you're good to go. In a small blender, mix together yogurt, tahini, garlic, lemon juice, maple syrup, salt and pepper until smooth. You may need to add a little water; just be sure not to make it too thin. I like to add a little sweetener to my tahini sauce to offset the bitterness. (I have a high sensitivity to bitter.) Just omit the maple syrup if you prefer. Would we order from Sun Basket again? Absolutely! 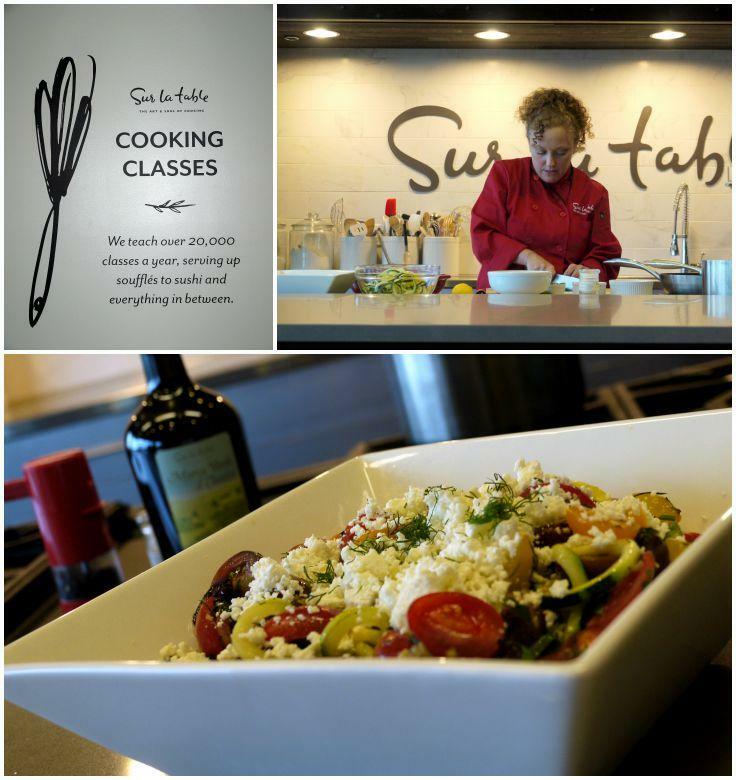 This service would be perfect for a working couple or small family, or anyone wanting to expand their cooking repertoire. You get reasonably priced gourmet meals, ordering is online is super easy, and you can skip a week or cancel at any time. Their demonstrated commitment to both the environment and quality customer service is a real selling point to us as well. 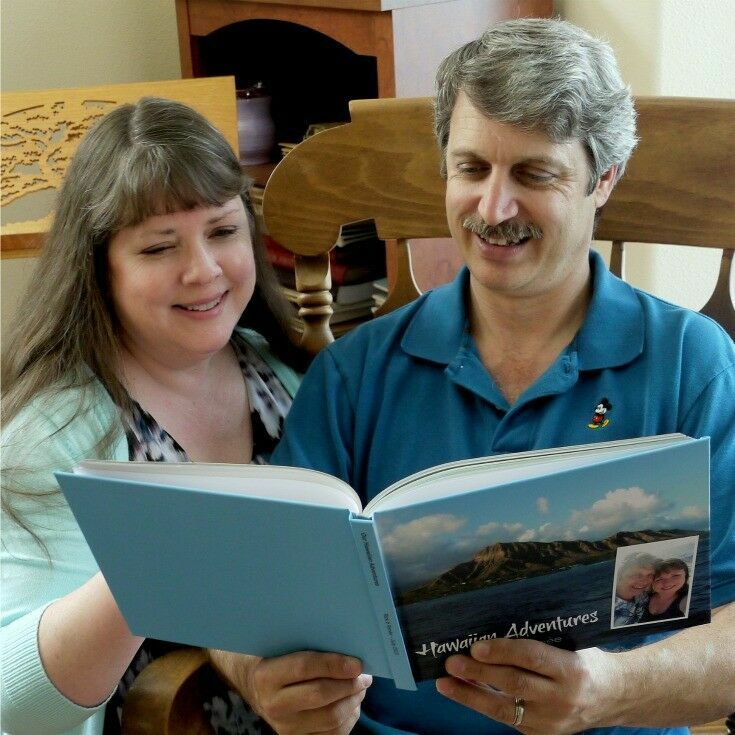 Capturing adventure in a Blurb photo book is simple, easy, and so worth the effort! Preserving memories in book form is a passion of mine. Since my preteen years, I’ve been an avid scrapbooker, adhering images and ephemera between the pages of weighty albums with everything from old-fashion black photo corners to high-end archival-approved adhesives. Keeping those images accessible and leafing through them from time to time with the people I love brings our experiences back with vivid clarity, and gives us all a chance to enjoy the memories together once again. About fifteen years ago, I made the conversion to digital scrapbooking and never looked back. The end products of my efforts are now high-quality hardback books, printed through one of a handful of dependable self-printing book services. 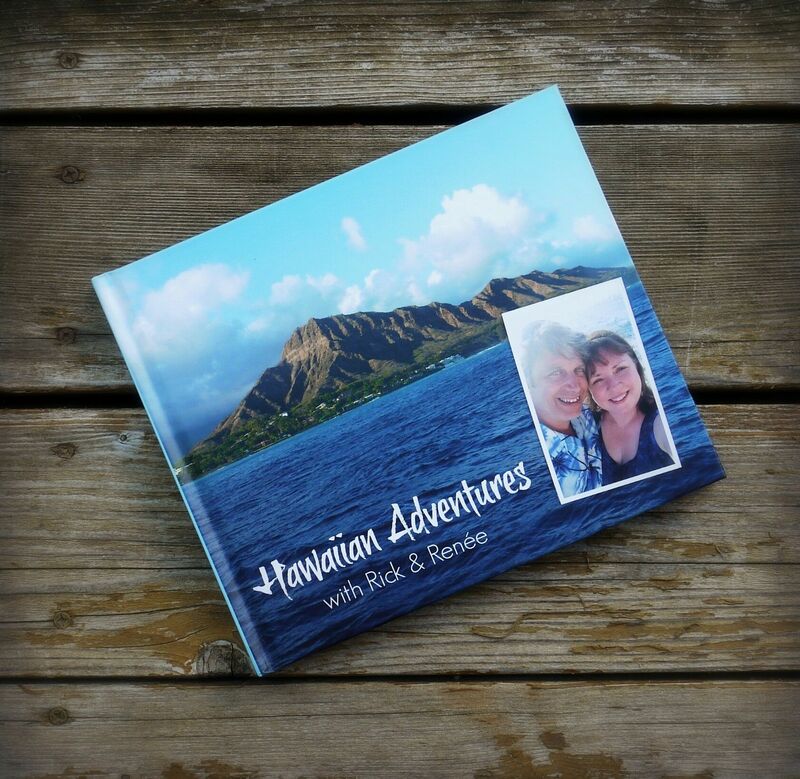 Our adventures in Hawaii were a perfect subject for a stand-alone memory book, and this time I chose to print it through Blurb, a well-renowned print-on-demand company that I have used a couple of times in the past. Blurb offers a number of both online and print formats, but for this review, I’ll be focusing on printing photo books. Blurb offers three options for shape and size, ranging from a small 7” x 7” square book to a large 13” x 11” in portrait or landscape. I chose a moderate 8” x 10” landscape book for our Hawaii album. There are also five paper options, with varying weights and/or textures; everything from the standard semi-matte up to Premium semi-gloss or Proline pearl. Blurb’s basic, standard weight is 80 lb. paper, (about the same as good-quality printer paper), but it cost very little to upgrade to the 100 lb. Premium paper. I strongly encourage that you upgrade too, especially for a book with a lot of images. (I went with 100 lb. semi-gloss paper for Our Hawaiian Adventures.) 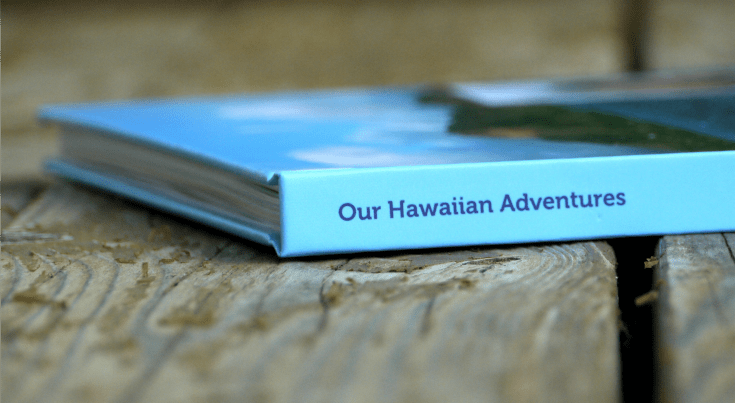 You can print up to 440 pages in one book: our Hawaiian Adventures came in at 114 pages! 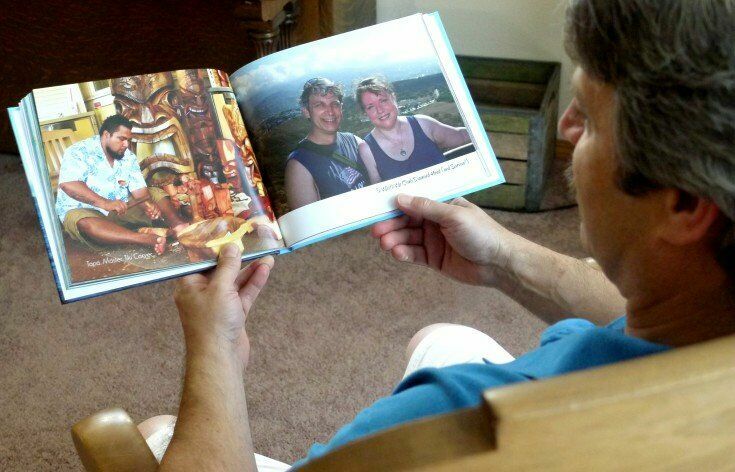 Now, let’s get to the two things we all really care about when it comes to making photo books online: Ease of use and quality of final product. This is where the rubber meets the road when it comes to online photo book creation. Some photo book printing sites are a little intimidating, but Blurb is not one of them. In fact, one of the things I like best about Blurb is the wide variety of options that they offer for content creation, and the ease at which a book can be completed. Whether you are a professional digital Creative or can barely turn on your computer, there is an option for you. Make your book quickly and easily without downloading anything. You can pull in images directly from Facebook or Instagram, or upload them from your computer and use Blurb’s templates and layouts to create a beautiful photo book quickly and easily. If you have Adobe experience, this may be just the thing for you. Blurb’s Adobe InDesign Plug-In is free to download, and lets you create and lay out books directly within InDesign, with output options for both print and digital formats. You can also work on your book within Adobe Photoshop Lightroom. If you prefer, you can use Blurb’s specifications calculator to fine-tune your PDF to a Blurb-friendly book size. I’ve used all of these options at one time or another, but for this project, I wanted a fast, simple method that would give me complete control over my layouts – and I needed to be able to do in while I was on the road and away from my primary computer. With that in mind, I decided to go with my all-time favorite online photo editor, PicMonkey. Step 1 – Create individual pages on PicMonkey. Save as high-resolution JPGs. 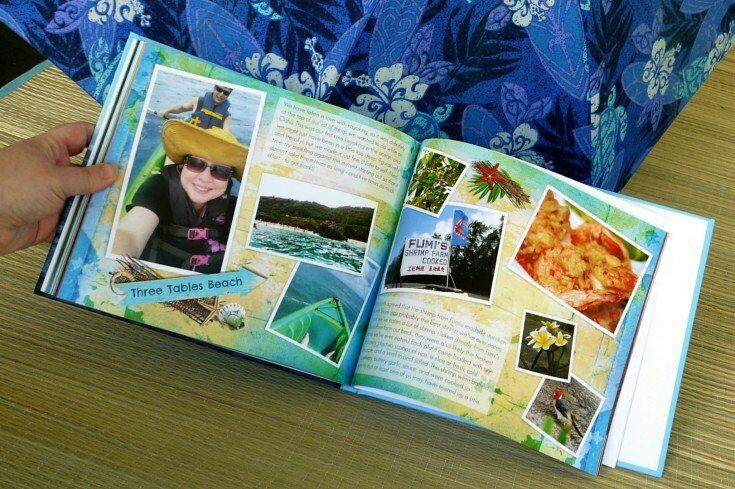 ↑ I created all of the images for our Hawaiian Adventures book in PicMonkey. I created all of my pages in PicMonkey, saved them as high-resolution JPGs, and then uploaded them to Blurb. Then all I had to do was drag them onto the pages as full-bleed images. After that, I just proof-read everything about 100 times (but that’s just me), and then ordered my book. That’s all there was to it. Step 2 – Upload Full-page images to Blurb. Drag and drop. As far as I’m concerned, Quality is the online photo book creation endgame. I expect my photo books to Pop! 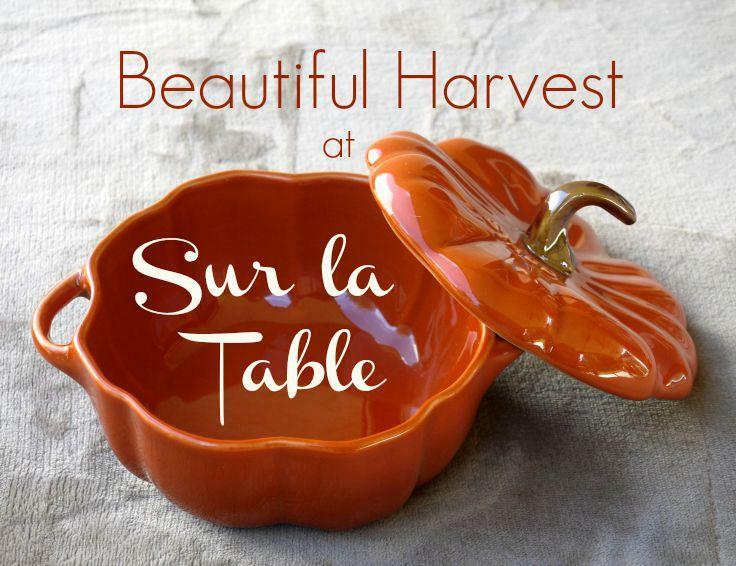 with bright, true-to-life colors, clean, clear printing, and solid, well-crafted construction. Anything less is unacceptable. Blurb did not disappoint. Overall, the quality of our Hawaiian Adventures book is excellent. The cover is solid, smooth, and semi-matte, which discourages fingerprints, and the cover image is clear and vivid. The printed images inside the book are sharp and clear, and the resolution is good to excellent. The colors are vivid and true to the digital preview. I do think that paper selection makes a significant difference here, so once again, I strongly encourage you to upgrade to Premium or Proline paper. Mr B and I could not be happier with our newest photo book. Flipping through those pages is like reliving our adventure all over again (yes, fellow grammar divas, I know), which makes all the time and effort it took to create totally worth it, and the book itself priceless. 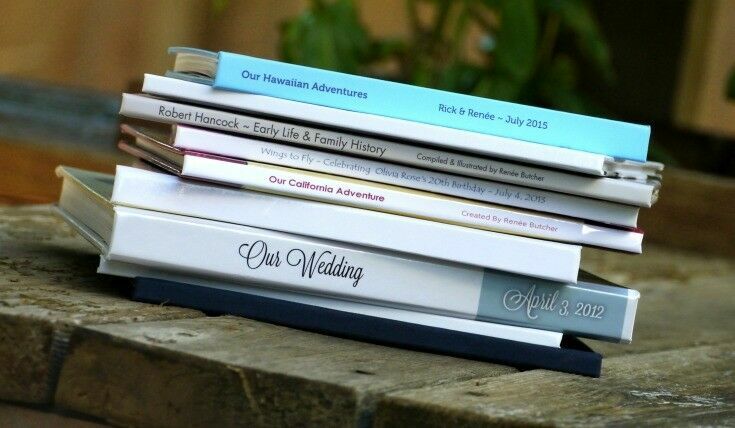 Ready to start your own photo book? Visit Blurb’s website to get started today! Looking for a full-size sedan with a smooth ride, plenty of cool luxury features that come standard, and a sleek exterior? You should definitely check out the 2015 Chevy Impala. Thanks to my role in the Chevy Shop Social: Portland, a fundraiser held recently to benefit Doernbecher Children’s Hospital, I had the opportunity to drive this sweet little number around town for a few days and run her through her paces. 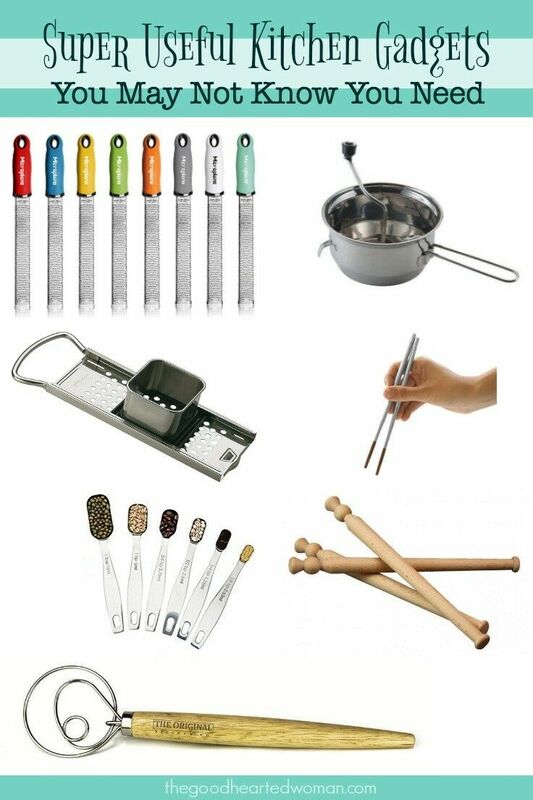 There are a couple of things you should know before we go any farther though. First, this is my very first car review. (Woohoo! And yes, Scotty at SheBuysCars.com, I would be willing to make the sacrifice and do another one should the need and opportunity should arise.) Second, every car I have driven in the past decade or two has been at least seven years old, so I’m pretty awestruck by things that many who drive newer cars may think of as run-of-the-mill or even compulsory. Every OnStar 4G LTE vehicle includes a 3-month or three gigabyte data trial (whichever comes first), after which you can purchase data in a monthly or one-time package. First off – everything was so cool! I was like a kid in a candy store. A candy store with Wifi! The touch-screen was relatively responsive and very easy to navigate. Connecting to the internet was easy, as was pairing my phone with the car’s system. The signal came in strong, and the kids had no problem surfing the internet while riding in the car. I also appreciated the fact that that the connectivity didn’t immediately drop when the car turned off. The navigation system was easy to follow and gave clear directions in a pleasant-sounding, courteous tone. (Which is a nice way of saying that it did not make me want to scratch someone’s eyes out as some navigation systems apparently are wont to do.) I liked that it warned me of upcoming traffic issues well in advance. Starting with the 2015 model year, every OnStar-equipped Chevy comes with a 5-year OnStar Basic Plan that includes RemoteLink Key Fob Services (remote start/unlock/horn honk), OnStar Vehicle Diagnostics, and Dealer Maintenance Notification. I didn’t need or use the OnStar feature while I had the car, but just knowing it was there gave me a level of security that I found very reassuring. Sometimes it’s the little things that make me the happiest. The Impala has many cool and new-to-me safety features, including forward collision alert and rear cross-traffic alert, but my favorite safety feature was the blind spot indicator sensor. (I’m sure there is a more technical name for it, but you get my drift, right?) Basically, it’s a little icon on the review mirror that lights up when someone is in your blind spot. I loved this feature. Sure, I’m still going to look before I go, but it gave me a lot more confidence when merging, especially in busy freeway situations. The Impala gets excellent crash test scores, due in part I imagine to the hundred (or ten) airbags that come standard. It also has an anti-lock brake system, a theft deterrent system, and all the other safety features (aka seat beats, child locks, etc.) we’ve come to expect. Another little touch that I appreciated was this secret little compartment behind the gearshift. It’s big enough for a phone, wallet or any other little thing you want to hide from plain site. For a car this size, I was pleasantly surprised by the generous trunk space: almost 19 cubic feet! Bottom line: Love it! As far as I’m concerned, the only thing Chevy forgot to include with this car was a box of Kleenex – to soak up my tears when I had to return it. Disclosure: This car was provided to me by our local Chevrolet dealerships working with She Buys Cars, for my participation in the Chevy Shop Social: Portland in connection with Doernbecher Children’s Hospital. A review of CHICKEN and EGG: A Memoir of Suburban Homesteading with 125 Recipes and an exclusive interview with author Janice Cole. Last evening before sunset, Mr. B and I pulled our deck chairs out onto the lawn for an hour and watched our little flock of young chickens glory in the green grass outside their coop. Occasionally, a truck would honk a few streets away or a helicopter would whir far overhead on its way to the airport, and they would run for the safety of the coop door, where they stood huddled until the scary danger had passed. Then it was right back to the grass again. 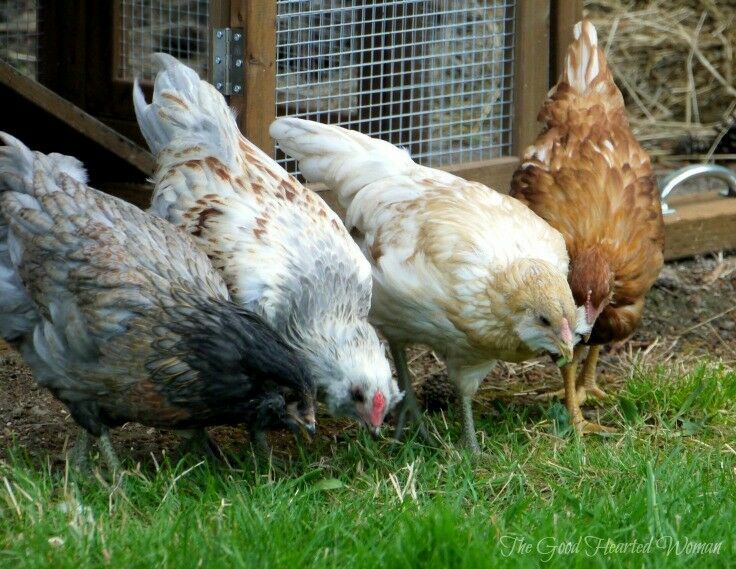 Our little flock is not at egg-laying stage yet – right now they just run around like gangly teens. In the fading of the day, life was sweet, sitting there watching Rosylnn Carter, Lady Bird Johnson, Harriet Johnston and Hillary Rodham Clinton peck away… our own little slice of Mayberry. Both a guide for new and would-be backyard chicken hobbyists and a recipe resource for home cooks; Chicken and Egg is an entertaining and informative read, even if you have no intention of ever raising chickens. 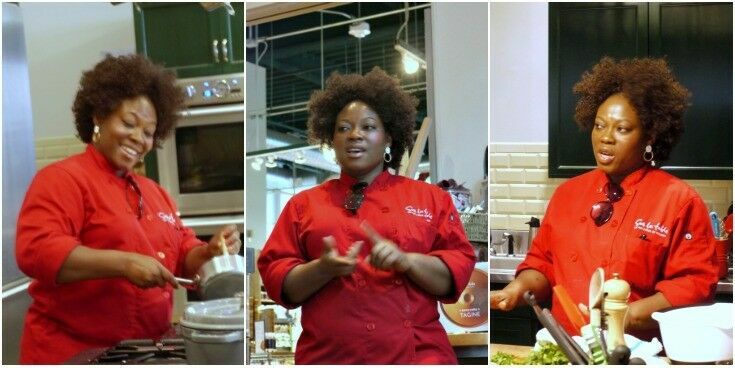 Both stories and recipes are organized by season, from Early Spring through Late Winter. (Yay! 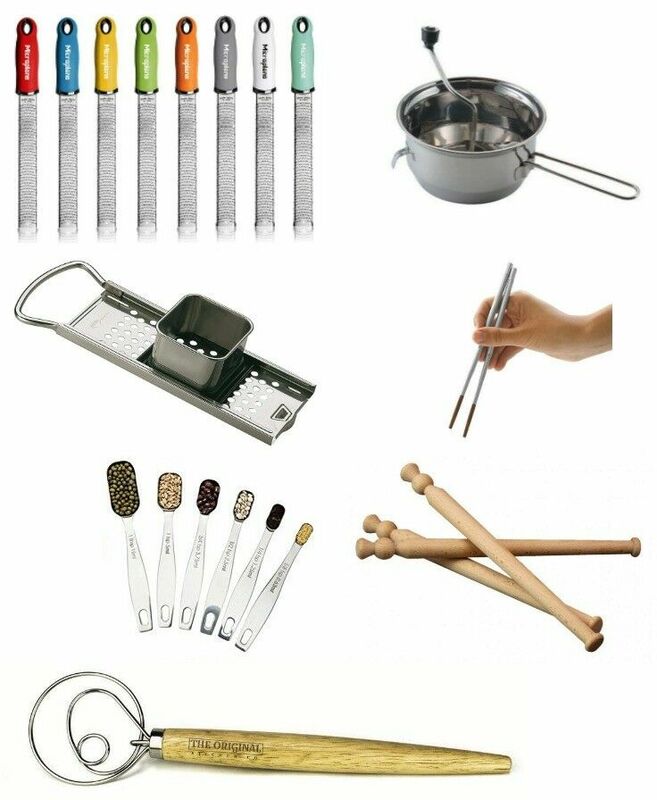 Seasonal cooking!) 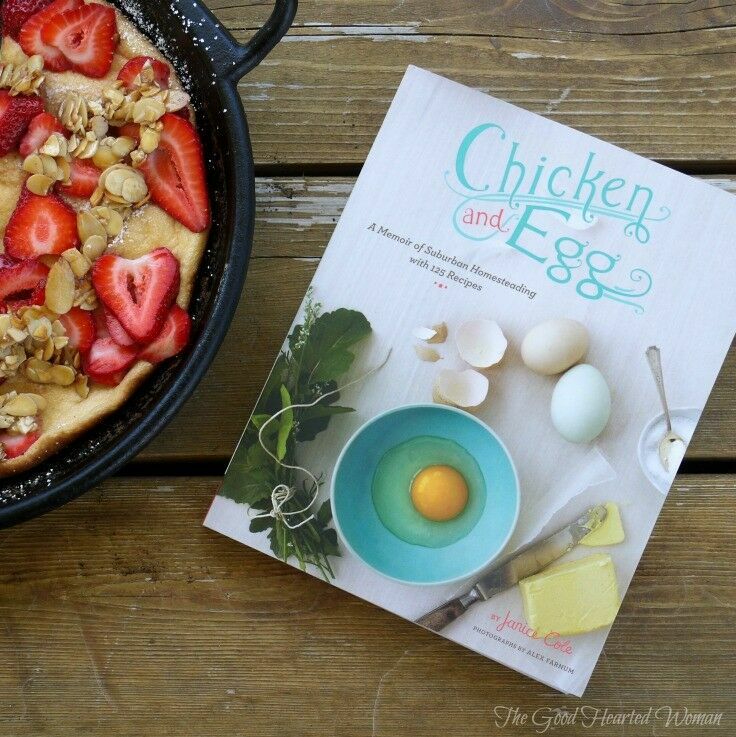 Lovely full-color photographs accompany the creative collection of 125 chicken and egg recipes, and all the recipes that I have tried thus far have been flavorsome, well outlined, and easy to prepare. However, recipes notwithstanding, it is Janice’s advice and recollections that make this book shine. Chicken and Egg covers everything from choosing a coop to the miracle of your first egg, and her stories of adventure and hardship with her chickens are engagingly funny, making for an easy, relaxing read. 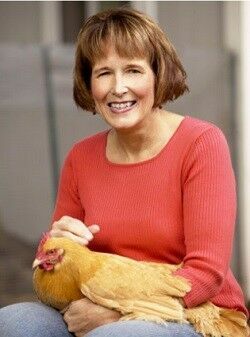 Janice was kind enough to answer a few questions for me, and her thoughts reflect the same love for her chickens that is so well expressed in her book. Photo courtesy of Janice Cole. What advice would you give to would-be suburban chicken farmers? I would advise them to begin small. 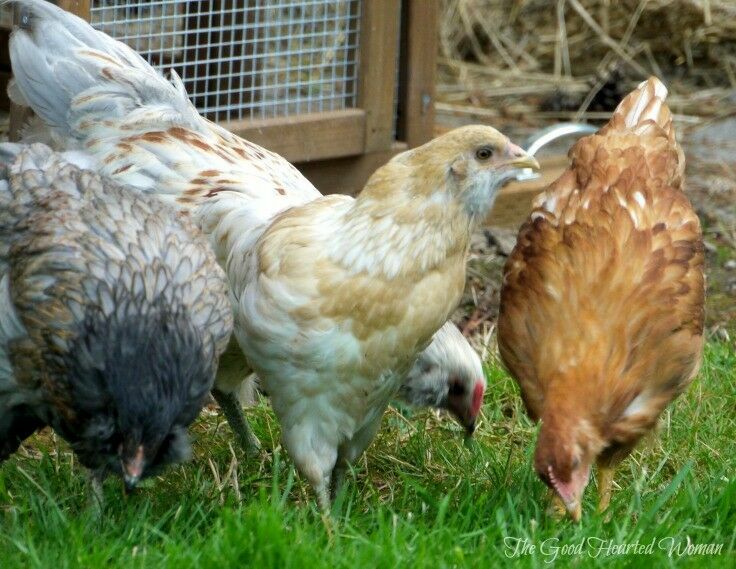 Start with a flock of three or four hens at the most, as a small flock will be a little less work, require less feed and less clean up than a larger flock. You can also get by with a smaller coop, which may be easier to build or less expensive to buy. If you find that you love it, then by all means increase the flock size. I would also ask new owners to consider the future of their hens. Will they be keeping their hens as pets until they die a natural life? (If so, as my experience points out, this could be ten years or more.) Or will they want to rotate their flock so they always have fully laying hens available? If that’s the case, will they be able to slaughter their hens or bring them someplace to have them slaughtered? They should know, there really isn’t a market for those who want to give away their non-laying hens to someone who will keep them as pets. Cleo, one of my three original girls, passed away. She was over nine years old—amazing for a chicken—but still doing remarkably well in spite of suffering from a tumor in her abdomen. One minute she was eating a treat of fruit; five minutes later she had passed away. Knowing she was ill, I honestly expected to lose her over the winter months but she had continued to eat well and keep up with the rest of the flock. Luckily she didn’t seem to be in much pain. It’s always hard losing a pet, as I’m sure you know, but I felt especially sad because she was one of my favorites and always loved to sit cuddled in my lap. Her flock mate Roxanne (also in the book) is still going strong and, in fact, is still laying eggs this spring! What is one of your favorite chicken stories that didn’t make it into the book? I think one of my best memories since writing the book has been watching a mother chick handle her babies. What was fascinating about this experience was that mama Jazzy had hatched eggs that were not her own, so the chicks quickly grew larger than their small bantam mother hen. It didn’t bother Jazzy or the babies at all; she continued to smother them with love and protect them with a fierceness that was amazing to see. She grew twice as large as she fluffed up her feathers protecting her babes from the other hens in my flock. And as the chicks grew larger than mama, they all still tried to hide under her tiny wings and faithfully followed her in a line around the yard as she marched them proudly around showing them how to dig for worms and chase bugs. Bottom line: Janice’s book is entertaining, informative and full of delicious recipes. If you are interested in keeping chickens, or just like to cook, I highly encourage you to check it out. Be sure to tune in tomorrow when I’ll share Janice’s recipe for Strawberry Soufflé with Caramelized Almonds. Disclosure: I did not receive any compensation for writing this review, nor was I asked to do so: I wrote it because I thoroughly enjoyed the book and wanted to share it with you. This post contains an affiliate link, for which I make thousands of dollars each time you click on it (said no blogger ever). Secondary Disclosure: I don’t really makes thousands on affiliate links. More like a penny. Maybe some pennies, but that’s it. Seriously.